Okay, I am going to admit it. My name is Janna and I do not feed my kids organic food. Well, not very often. Maybe if there is a sale. I don't even feed my children healthy food. This morning- Drew had Cookie Crisp cereal. This was after copious amounts of whining because we were out of chocolate chip mini-muffins. Why not blueberry you ask? Because he doesn't like blueberries. That's fruit, yo. In a muffin. It's healthy food disguised as a muffin! Before you judge, understand that I am in a losing battle with Mr. Bee. He has the biggest sweet tooth of anyone I have ever met. He starts jonesing when we are out of chocolate, I kid you not. When I was working retail and he took care of Drew on Saturdays and Sundays he gave Drew his first taste of chocolate, a peanut butter cup at age 18 months. My head almost exploded when I found out about said indiscretion with the sugar, I was so mad. It has been downhill ever since. Drew now has the biggest sweet tooth, and he especially loves chocolate too. I can't decide if this chocoholism is inherited or learned behavior. Probably a little bit of both. I am also to blame here. My exhaustion over morning routines led to the horrible breakfasts that my family consumes now. I am only human and I have to get a 17 month old and a 4 year old ready and out the door by 7:30 by myself- My husband has already left for work before they wake up. I don't have time to argue about breakfast. So in short I am ashamed. I have been trying to incorporate new fruits and veggies, making sure they have at least 2 or 3 a day and Drew is getting much better about eating vegetables (for a while he would only eat corn or broccoli). Mr. Bee is even making an effort, touting apples as "special treats" and cutting them up for everyone to share. It works most days. So it's not as if we AREN'T trying... but overall we are teh failure at getting our children to eat healthy. You are welcome to comment with suggestions, but I warn you- if they are not easy suggestions I will not have time to implement them. That is unless they have come up with a fruit or vegetable that tastes, looks and smells like chocolate or you want to cough up the dough for an organic chef to visit our house. Sorry. And yes, after work I will be running to the store for Non- organic- i.e. poison milk, non-organic ground beef (yes that red meat- I don't even know where I would buy organic meat where I live, we don't have any fancy Whole Food stores or the like) and-- cough-ahem- chocolate chip muffins. NO JUDGEMENT. I would like to point out that Drew asked for candy sticks (I didn't buy them, he got them in a goody bag for a birthday party, I swear!) for breakfast. I told him no. I do have some limits. We do keep lots of fresh fruit around, it's easy and he loves it. and now it'll be in season again!! Since I don't have kids, I have no clear idea on how to get them to eat more healthy foods. I imagine it has to do with making healthy foods readily available and leading by example, but I'm sure that's easier said than done. I've read that it can take up to 15 exposures to a new food before a child will accept it. I've also read that you can make fruits and veggies more appealing by providing them as finger foods with dips such as hummus, salad dressing, or peanut butter. Breakfast on the go is tough... What about whole-grain cereal or granola bars as an alternative to muffins? Oh, and chocoholism is totally inherited and learned. My mother has always has stashes of chocolate (the dark kind, primarily) in her house, as do I.
I hope the peanut butter cup was a Reese's they are the best!!!! hehe Dont feel bad I think there are probably more house holds like yours then there are the organic eating ones. HAHA - too funny! No judgement here! Your meals sound like ours! I have bigger fish to fry! OMG!! You are I are two peas in a pod! I work full time, and my children eat crap. We are big fans of the Eggo Bakery Style Muffing tops. Yes, they come in chocolate chip, and there are 4 little muffins connected that you can pop in the toaster! Or, if you are 3 you eat them frozen. We also enjoy sloppy joes and hotdogs. This advice is coming from a single gal with furry felines as kids, so beware. No, I do not recommend your kids get Meow Mix meals, no matter how much the bag advertises its fresh meat and veggie content. There's a cookbook out there by Jerry Seinfeld's wife. I think it's called "Deceptively Delicious" and it's about many ways you can sneak veggies into your kids' food. I don't have a good diet myself--and I'm just feeding one person here! That having been said, I have a cat that enjoys Cheez Its, especially the parmesan garlic ones. Please don't judge me or call the ASPCA. My husband is convinced McDonalds is part of the 4 major food groups. And he isn't to big on veggies and fruits. He looks at ME like I'm the alien. I did read somewhere though this mom bought the V8 infusion juices and mixes it with yougurt and they have smoothies in the morning. Maybe try that? I am. I'll feel better. My hubby has a BAD sweet tooth! He will throw down for some Hostess Ho Ho's. His coworkers call him Snackster because he always has to have his sweet snacks. Ain't nothin wrong with peanut butter cups for breakfast...right? My son had Reese's Puffs cereal for breakfast. Basically peanut butter cup cereal. I kid you not. My daughter had Smores cereal. I shall not judge you if you do not judge me. Yipes! I hate to think of two active little boys hyped on sugar. But here's an easy addition, on pizza night, incorporate ROASTED vegetables. They're the simplest thing in the world. Heat up a baking pan, toss the veggies with olive oil and cook them until they are soft and with a nutty smell. You could start them off just before you put the pizza in. Believe me, roasted veggies taste miles better than steamed or boiled. Broccoli would be the best. Hey, at breakfast, there's nuthin' wrong with cereal. How about cutting their junk cereal half and half with "good" cereal. Then there's all that milk and that's nutritious. And if those suggestions don't work for you, how about this food for thought. I was raised eating health food long before anyone knew what tofu, amaranth and granola were. When I went to college, I went on a junk food binge that lasted for years. So the way your kids are eating, they'll grow up to be Vegans! You are doing the best you can. I remember those days well. My children, 20 and 17 are both very healthy and not overweight and survived the quick meals. Through grade school they ate a lot of salad (green leaf, romaine etc. with carrots) and green beans as the side dish. As far as fruit, I am not able to have fresh fruit or fresh vegetables due to a stomach problem so we ate can prescribed by my doctor who informed me the nutrients are still there, so if you don't have the time to cut up fruit give them the can my kids ate it fine. They have survived off of Mac and Cheese and Spaghettios here and there along with a lot of activity and a few good meals in between. BALANCE is the key. Two out of my four kids fight eating anything!! 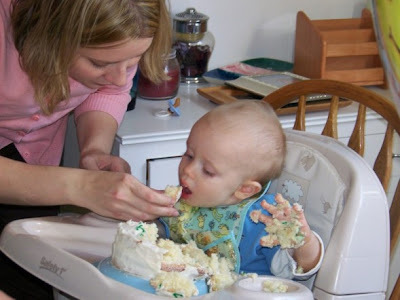 If it will get my little girl to drink her milk, I'll definitely give her some cake. Kids are hard to feed. We all do our best and I know that the kids will turn out fine. You're doing a great job!! No judging here! They are fed, clothes, loved and have a warm place to sleep...You are doing great :) I've also heard about "Deceptively Delicious" and my friend Beth (a mom of 3) SWEARS by it! Seeing as I am not a parent this is coming from only my personal experience. Growing up my mom was a working mother with two young kids and a husband who refuses to eat anything that even remotely sounds healthy. So my mom was on the go all the time, trying to work from home and take care of us. She'd cook dinner every so often but usually took us to either Jack-in-the-box or McDonalds. And when she'd try to feed me healthy food my question was always well daddy doesn't have to eat it. Or Why does daddy get to eat 2 big cookies before dinner and 1 after dinner? So I ended up often sneaking the giant 5 inch wide cookies in the back yard and eating them in the bushes. I figured If daddy got to then I should too. I became overweight [its in our genetics as well] fairly quickly in my childhood. Now, at seventeen, I eat almost all organically, [other than poultry and meat] dont eat red meat [very often] and can go weeks without sugar. I also havn't had a fast food meal or french fries in over a year or two. I sometimes wish that my parents wouldn't have kept junk food in the house but I know that it never would have worked with my dad. And truth is, junk food is cheap, easy and fast. So my suggestions, instead of sugary cereal, try something like honey nut cheerios, still sweet but no added sugar and it's much healthier. And with picky eaters, don't make numerous meals. If they don't like what's being given they don't have to eat it. Trust me, they won't starve themselves by going a night without dinner. Kids will eat when they're hungry. Finally, don't treat desserts or "fast food" as a reward. It creates a lifelong habit of bad eating with good things. Just a few quick suggestions. Hope they helped a bit. Yay, yay, yay for this post! I am exactly the same way, and so is m toddler! I HATE to cook, and have such a hard idea thinking up simple, quick things to make that my kid will like. Frozen chicken nuggets and grilled cheese sandwiches are a staple in our house! A couple of tricks on the fruits and veggies. A) Voots. They are these little sweettart like tablets that contain all the goodness of a full serving of veggies AND a full serving of fruits. I got them at Costco and my picky eater thinks they're candy. B) V-Fusion juice. I give it to him twice a day, cut in half with water. It's another full serving of fruits AND veggies! C) Flat Earth crisps. My kid calls them cheetos and he has no idea there is half a serving of veggies in them! Okay, your turn. Share any tricks you have for me. We can use them! No judgment here. I just had to chuckle, because you husband sounds like mine, I don't want to be around when we run out of sweets in the house! This is so me. I hate to cook. I only hate to cook because I don't know how. It got harder as my kids got older. Hanna will only eat apples.. and never green apples. Sometimes bananas, but lots and lots of apples. Not many veggies though. The boys are different.. Jake eats almost anything. Dakota is picky. Loves salad, grapes, and raisins. They have to try foods at least once. This is good because I gets lots of crinkled noses, then a, "Hey, that was actually pretty good. can I have some more?" I remember in elementary school when they always ALWAYS served broccoli with pizza. Always. bluck! There is no veggie that goes with pizza - unless they're weird kids who like them ON the pizza. (sorry if they're weird - I'm weird, too). Organic meat? It's like five times more expensive! PB&J has protein, too, and it's freaking cheap. ;) Sure, we have it every day for lunch... nothing wrong with that. Totally don't feel bad! I have the same problem...and I don't work. I'm just a bad cook. My one secret (which has probably already been suggested): Strawberries dipped in Hershey's Chocolate Syrup. My son loves it (it is a bit messy) but will eat strawberries like crazy. Can also do with bananas, oranges ... almost any fruit tastes good dipped in chocolate. If chocoholism is inherited and genetic, my kids will have no hope of eating healthy! Ever! Once they get chocolate, why would they want anything else? Can't really blame them. How about trying the fruit-n-nut trail mix--it's real good to snack on. Strawberries taste real good on Frosted Flakes or Rice Krispies or any of the chex cereals. I don't cook either and am just now trying to include more veggies and fruit in my diet. I have pizza 3 days a week (only two slices per meal though). I'm going to risk hate comments to say: THANK YOU!! I get so tired of everyone saying they only eat/serve/feed organic. And that their children never watch tv, eat processed foods, or do anything uncute. Thank you for being a real live human parent!! Seriously! OK, I fully understand. I'm not super with food, either, although I do cook, but that doesn't necessarily make a difference for us. One thing I do as far as breakfast is concerned, though, is I make brinner for dinner once a week - whether it's pancakes or waffles, I double the recipe, and freeze the leftovers, and there's breakfast for the week. That's helpful - not sure it's healthful, but it's helpful. I am trying to introduce more veggies and fruit into my diet, but I'm not a huge fan personally, so it's just plain tough. Thanks for being so honest here! Sigh. It's not like you can force food down their throats - if they won't eat it, they won't eat it. Try to sneak healthy things inside of other things - like, hide it if possible. I was a terribly picky eater as a kid, but I grew out of it. I don't think there has been any permanent damage. But let me offer some ideas: Marie's light bleu cheese for dipping cut up peppers and carrots (even *I* loved this as a kid) and peanut butter toast (SKippy Natural is my favorite) for breakfast. Both things are quick, easy, kid-friendly and no cooking involved (unless you count the toasting). Happy SITS Day! I also work (two part-time jobs, though one is almost done for the season) and really struggle finding the time and energy to cook. I am working on turning over a new leaf, though, shooting for just a couple of home cooked meals per week (while reviewing a meal-planning site--double whammy). Also, we took the kids apple picking with us several weeks ago and the 2 y/o is still obsessed with apples. Getting them involved when possible really helps. good luck! Hows about Chocolate-covered Carrots? Sound good? LOL! I'm just happy if my kid eats at all! My little guy is such a picky eater. My pediatrician suggested that I give him one Pediasure a day to make sure he gets all his vitamins and minerals. They are expensive, but as a working mom, I totally appreciate not being pressured to puree veggies and fruits to hide in food to make sure he gets all his vitamins. And yes...my little guy has a sweet tooth. I busted my hubby giving him Krispy Creme's at 12 months! Stopping by from SITS on your day! Congrats. I am unable to feed myself healthily, let alone my family! Which is why I'd make a hopeless mother and just stick to part time step-parenting! Oh and the only thing that goes with Pizza is fries!! I try my best to give the kids healthy stuff like fresh fruits and veggies, whole grains, and organic dairy, but I also give them Kid Cuisines, pizza, burgers and candy. I think making anything forbidden just makes it more desirable. It's all about balance! Don't sweat it. As a grown-up who grew up in a home full of homemade and healthy food, I now subsist on string cheese and coffee. Honey, organic is just another word for overpriced! My kids grew up on a lot of "crap" food and their just fine. Now their teenagers and perfectly able to microwave their own frozen pizza's! Haha, this was such a cute post! Don't worry, I don't think anyone will judge you... it's got to be an act of Superwomanly strength to get a baby and toddler ready in the morning. I also think that childrens' taste develops more when they get a bit older. I used to pick the onions out of my spaghetti sauce when I was little (who does that? They are so small!! ), but now I love them and I'll eat just about anything :P.
Love the confession - you are doing the best you can - don't be so hard on yourself! We all have to take shortcuts somewhere in order to put our love and energy into the areas of our parenting that feel are most important. Your kids are loved. Your family is fed. You're a wonderful mom, and your children will thrive because of it. Healthy eating can happen in baby steps, and as the kids get older their palattes for new foods will likely expand, and your menus broaden. I'm with the commenter who said they're just happy if their kid eats at all. Honestly, who knew it was so hard to get a one year old to stop moving long enough to eat a meal? I'm certainly not going to give you a hard time...you are a working mommy doing the best she can. I can only share my upbringing as an example of what may work. my mom raised six kids and worked and we all ate our fruits and veggies. She cooked on weekends and warmed up our dinners when she got home. I like to think that we are all healthy and not overweight because she instilled good eating habits in us so young. BTW, we did have the occasional pizza or hamburger or cookie...she wasn't a total drill sergeant. HAPPY SITS DAY! Stopping in from sits! I am so glad to hear that I'm not the only one! I have read so many blogs where the moms say that they have picky eaters in the same sentence they say they eat vegetables and I think I have gone crazy! We're trying to incorporate more but it's tough and who wants to fight about it every night! I have a really hard time making healthy dinners after work also. I am just tired and they are hungry! So, it works out great when I get a yummy and easy crock pot meal prepped the night before and turn it on in the morning before I go to work! So nice to come home and have a delicious dinner waiting for us. And my kids don't get a choice...what is made for dinner is for dinner!! Have a great day! Okay, now I don't feel so bad. HA. I hate to cook too. Fortunately my daughter is still breastfeeding. But I don't know what I'm going to do once she weans. I guess I'll have to learn to like cooking? You know what...if they are healthy and happy that's what matters. I just got back from grocery shopping and yet again felt bad for buying the nasty, sugary cereal...again. I have tried healthy food forays, but the kids rebel! high-fiber stuff because that used to cause... issues. Even Pop Tarts makes a high-fiber substitute. Hey Happy SITS day! My suggestion is home made pudding pops. Just get the low fat jello choclate pudding and make it (takes 1 minute). Pour into little popsicle containers and freeze. At least they have milk in them and less sugar, but are frozen chocolate! That has to count for something. And it is fast. Umm, poptarts adn breakfast bars. they are the breakfast of champions. Right? Right!?!? yeah, I don't have the time and/or patience to argue about breakfast either. I wish I could make pancakes in the a.m., but then I guess I wouldn't make it work on time. EVER. Because I refuse to wake up at 5 a.m. for pancakes. I've loved reading your posts today for SITS! I have two ideas (note, as my son is a baby I have only tested them on myself or friends' kids). 1) Mix in veggies with what you're already making (I love zucchini in chocolate cake). But, I just remembered you don't have a lot of time to cook so this one might not be so great. 2) Get a muffin tin and fill each tin with a different snack, some healthy, like celery sticks or apple slices, and some not, like M&Ms. When your kids want a snack they can just grab one ready to go from the muffin tin, but they have to finish everything in the tin before any snack gets restocked. You are not alone. Some weeks are better than others here :D Happy SITS day! Don't feel bad! My kids are probably worse. I call my youngest, my sodium nitrate girl because all she eats is salami, bacon, hotdogs. Some days I am lucky and she will eat chicken nuggets. We do cereal bars to, just easy and the kids are not into regular cereal!! LOL! Finally! I am an absolute fan now. Did you know that dirt is organic? It totally is, so I figure when my kids eat that it's healthy, right? The whole "organic" thing makes me crazy anyway. I think we as mothers are way to hard on ourselves. My kids will eat carrots and apples and so they have those every day. The rest is pretty much crap. And I blame it on their incredibly picky dad. And the fact that their Mom hates to cook. Love the post! What ever happened before organic foods?? My little one gets whatever baby food is on sale or that I can get for free. Otherwise Gerber it is. I hear ya! That is what my entire life is about. I don't care if it's organic, hell sometimes I don't even care if it's healthy. Sometimes it's just about eating, something, anything!!!! Hang in there! my only suggestion would be dips. strawberry yoghurt to dip fruit in and some sort of ranch salad dressing to dip veggies in. My kids love that. I'd even go for a little whip cream to dip the fruit in because unless they are overweight, which they obviously are not, they need the dairy and the fat for brain development. so it's a win win. It is hard eating healthy on the fly and while I try my best there are still those meals that would have a nutritionist shuddering. Just do the best you can and keep trying the fruit and veg when you can. With pizza.... we like sliced bell peppers. They are super sweet and again, with ranch dressing my kids eat them up like crazy. Same as cucumbers. Why not just a quick raw veggie plate. You can buy packs pre-cut now. Happy SITS day. I really enjoyed checking out your blog. I DO have a suggestion for a fruit/vegetable that tastes, looks and smells like chocolate! Chocolate pumpkin muffins - and they are beyond easy. A box of Duncan Hines devil's food cake mix (none of the other ingredients, like oil or eggs - just the powder) and a can of pumpkin puree (not pumpkin pie filling, but the pure pumpkin). Mix together and bake in a muffin pan for 22 minutes. Rich, chocolatey, very moist and they DO NOT TASTE LIKE PUMPKIN. Sometimes I throw in half a bag of semi-sweet chocolate chips when I'm feeling naughty. Which is often. too funny! I had to work when my first 3 kids were little and I am so right there with ya! All I can say is they turned out pretty darn good and eat their veggies on occasion!No permanent damage done! When Nana is over, she lets the kids have candy with breakfast! We are all trying to change our habits here. Now that hubby is on board it is all easier! I love this post. You're honest and you aren't trying to shove organic/homecooked everything/healthy food only down my throat. And I have the biggest sweet tooth ever! It's one of my biggest weaknesses and I hate it! Little's new favorite treat are these adorable (yummy and good for you ..shhh) freeze dried apples I get in the tinned fruit section at my grocery store. One bag has tons of bits in it and they are super sweet and crunchy, plus the mom bonus of the fact that one bag is equivalent to a whole apple! Oh honey don't feel too bad. In fact, feel good, because you made all the rest of us feel better because we're not the only ones! I was asked recently by my 16-year-old son if I would please stop serving vegetables at dinnertime. I liked it that he threw in a "please." It's better they learn from you then from some cake junkie out there. lol. Being organic ALL the time, no fun. "LET THEM EAT CAKE!" Hehe, we live the same way. I try really hard. I'm going to start making bento lunches for my son. So far my mini attempts have gone over really well and he eats the whole thing. You should visit my site and see some of the muffins I have made though. My little man is a muffin addict. We call oatmeal bars "Special Muffins" and he gobbles them right up. Hehe. O-M-GEEEEEEE I think we should be BFF's..I like Geeks, take pictures of my shoes, and don't cook either! The only reason my kids are served vegetable sis because with the daycare the state requires me to serve them all X amount of fruits and veggies. My kids never eat them. And they have Lucky Charms every morning for breakfast. And we eat McDonalds more often than I care to admit.